Vegas has built up its own permanent, immigrant communities that are putting their stamp on this city’s food scene. What’s more American than that? I love Las Vegas. Don’t hate me. For decades, Vegas was essentially food negligent. There were some decent steakhouses and lousy casino buffets. Folks went to Vegas to gamble, see a show and lower themselves slowly into the hot tub of depravity that made the town what it was. Long ago, what happened in Vegas, stayed in Vegas—not because it was a cute cliché, but because it was a blood oath! In the 1970s the ostentatious excess of casino hotel restaurants became synonymous with oversized and flavorless casino buffet fare. A few decades back, the city became a haven for famous chefs to flaunt their stuff with giant-sized hotel subsidies and the game was on. The food got better, the shows got better, the hotels and casinos expanded with larger than ever guaranteed audiences and giant revenues. Hotel and chef partnerships have exploded in recent years, but so has the off-the-strip food scene. You see, to support the city’s insane growth, a huge working class of Central American, Mexican and Asian immigrants have moved here, bringing their authentic tastes of home with them. Combine those seemingly disparate worlds and you have a food scene off the strip that rivals anything on it. Vegas has built up its own permanent, immigrant communities that are putting their stamp on this city’s food scene. What’s more American than that? While the Strip is still the gambling and hotel epicenter of this hedonistic paradise, from a food standpoint it’s no longer all that Vegas has to offer. Go check out Spring Mountain Road and its surrounding neighborhood and tell me differently. I dare you. For years, everyone has known about Lotus of Siam, Raku, Monta Ramen, J&J Szechuan and a half dozen other places to try superb Thai, Chinese, Japanese and Korean cuisine without having to walk through a 3-acre hotel lobby to find the front door. 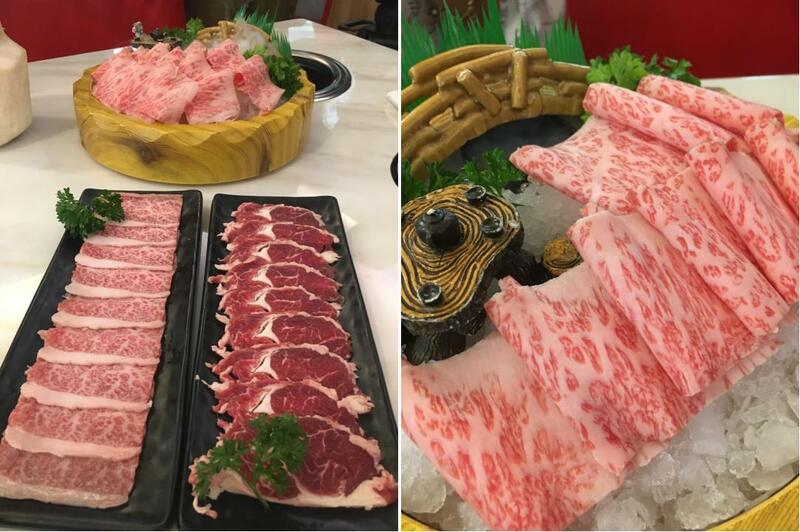 At just a year old, Chubby Cattle is one of those restaurants that instantly went on my list of go-tos for anyone visiting Sin City. Think Mongolian Hot Pot, Vegas style. In Vegas, you simply can’t leave well enough alone and while I thought there wasn’t anything you could do to improve a traditional Mongolian hot pot restaurant, I was wrong. For the uninitiated, these places offer up meats and vegetables for customers to cook up themselves, skewered, in shared pots of bubbling broth. At Chubby Cattle, it’s all about over the top options and deliciousness. They call themselves reformers of tradition.